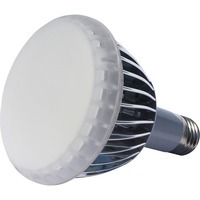 LED advanced light BR 30 is an energy efficient downlight designed to last 50,000 hours. Dimmable bulb requires just 12 watts to match the lumens in traditional, 75 watt incandescent bulbs. The smooth beam patterns and warm, white light are ideal for general illumination in a wide range of residential and hospitality applications. Design also includes 810 lumens, 2700K color, flood beam and no UV or IR radiation.